In other words, the rich get richer and the poor get poorer. But it’s not just a biblical principle. It has a lot to do with how our kids learn, especially their reading comprehension, vocabulary and other English language arts. I have three kids under the age of 6, so when I hear something that can give my kids an edge, I perk up. Researchers have found that those who are “rich” in knowledge get richer in knowledge. Those who aren’t have a hard time keeping up and the gap between those who have knowledge and those who don’t widens. That’s because when you know one thing, like, that Egypt was ruled by pharaohs and is home to great pyramids, it’s easier to learn a new thing, like, a sarcophagus was a fancy coffin used to bury pharaohs. The brain already has an information structure of Egypt and pyramids to house the new word, sarcophagus, and make it stick. If you don’t have that foundational information in place, it’s a lot harder to remember the new stuff. This idea of "the more you know, the more you can know" is a virtuous cycle. In fact, some argue quite effectively, that the low reading scores we see across the country aren’t so much a “reading” problem as they are a knowledge problem. Give a “weak” reader a story about something he knows a lot about, say baseball, and he’ll score better on a reading test than a strong reader who’s very unfamiliar with the terminology, purpose, and culture of the game. That’s been tested. So, then, the question is, how do we help more kids build up larger foundations of knowledge, especially at school? Or more to the point, how do I help my kids and how do you help yours? A couple weeks ago, researchers at Johns Hopkins University in collaboration with Chiefs for Change, a national education nonprofit, released the Knowledge Map, a tool to help schools “map the knowledge” kids are getting from their classrooms. Take a second to look at this example chart. You can see that kids in preschool (PK) are exposed to eight or more books on science and animals, one on astronomy and none on chemistry. This is just one example, of course; each school will be different. But Chiefs for Change wants to go into schools and essentially do an audit of the knowledge schools are giving kids so they can visualize it on a map, like the one above, and make better choices about the books they put in front of students. Think about all the different subjects a child can know about: science, animals, astronomy, chemistry, ecology, electricity, the human body, and on and on. Depending on what school your child goes to and what that school selects in terms of reading material, your child will develop knowledge in some of those areas more than others. When I saw this “Heat Map,” it clicked for me. 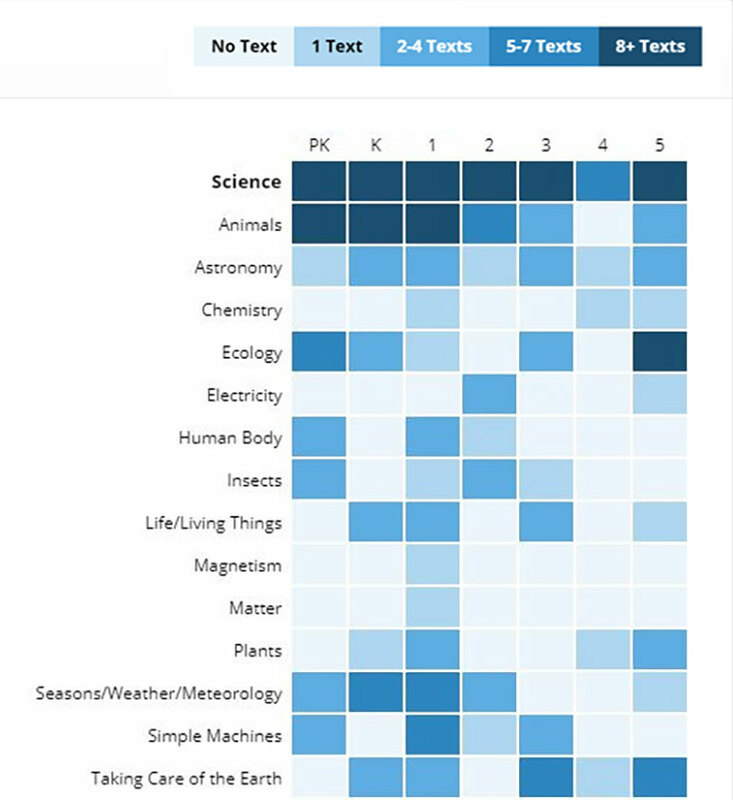 In about 10 seconds, I informally “knowledge-mapped” my home and realized that, similar to the example chart, my kids were getting a lot of exposure to books about animals, insects, plants and the human body, but practically no books on electricity, chemistry, or magnetism. Come to think of it, I’m not even sure they make a lot of books on chemistry, electricity, and matter for kids as young as mine. But as parents, we shouldn’t have to do it alone. Our schools should be looking at the same question: Are they exposing kids to a wide range of subject matter in English language arts classes so they can give them a stronger foundation in knowledge? I’m doing my best to put the Matthew Effect into action for my own kids, but with the Knowledge Map tool, schools now have a very practical way to make it happen for all kids. Contact education contributor Lane Wright at lwright@educationpost.org. I agree Lane. Great hook. I agree Lane. Great hook. But I also love the science of education and have forwarded a link to your article to many. Lane, very interesting lead to an article that had little to do with the lead. I did read it and found your thoughts interesting and informative. Good job on the “hook “ to “reel” the reader in. Can you say more about how the lead didn't relate? It's all about how students, rich in knowledge are in a position to get when more knowledge. It's about building a foundation and this knowledge map tool can literally help schools do that, and parents like me. So I'm not sure what you mean.